TRAI has released their monthly telecom subscription report for month of August, and it is evident that growth in mobile subscribers is still happening at pretty rapid pace. 2014 has been generally quite good. Since January 2014, India has added 38 million new subscribers in it’s kitty as compared to last year when it added just 23.7 million through the year. With 4 months to go, 2014 should easily cross 50 million new subscribers. According to the TRAI August 2014 report, India added 5.6 million new mobile connections, taking the total tally to 924.32 million. Interestingly, active mobile subscriber base saw a jump of over 10 million. 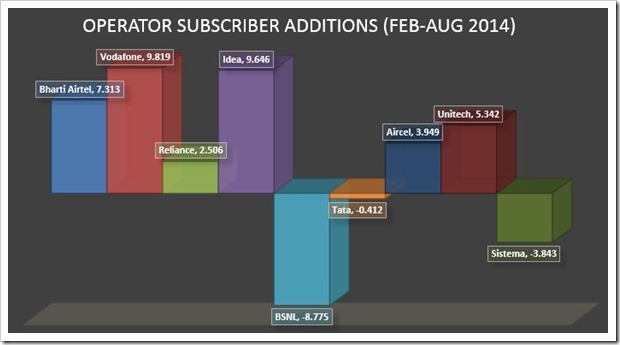 In month of August Idea was the top operator adding over 1.7 million new subscribers, whereas BSNL continued to lose with nearly half million subscribers further moving away from them. Here is the how total new mobile subscribers have been added over past 2 years. Active mobile subscribers (people who used their phones atleast 1 in a month) saw significant jump in August, with over 10 million getting added. 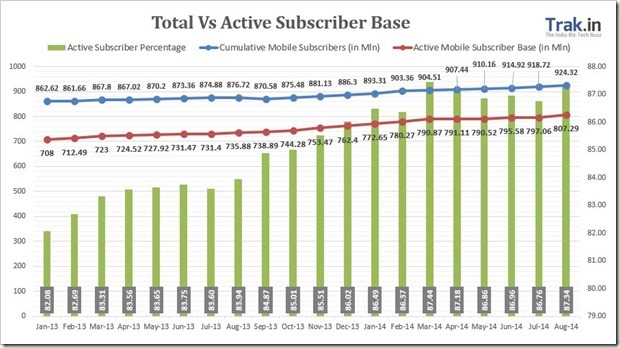 Compared to July 2014, when India had 797 million, August witnessed 807 million active mobile subscribers. The percentage of active subscribers now stands at 87.34%. Here is how active subscriber base has grown over past 2 years. – With an increase of 5.60 mln in August 2014, total mobile subscriber base has reached to 924.32 million. 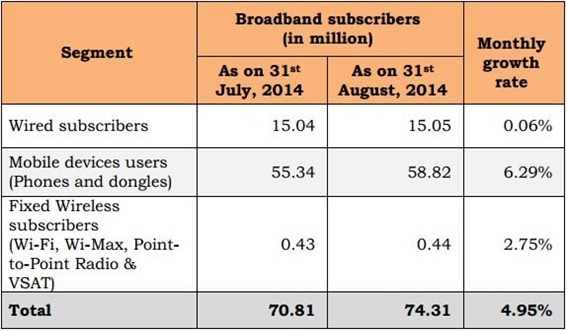 India had 918.72 million subscribers by end of July 2014. 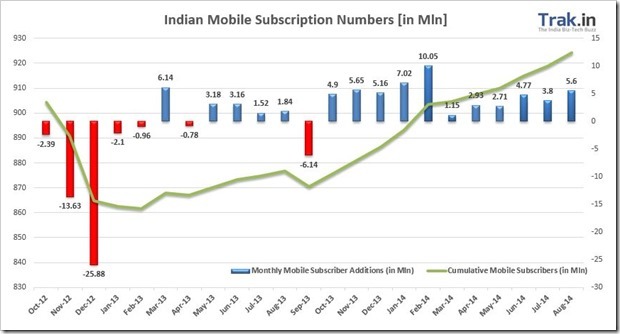 – Urban India witnessed a monthly increase of 0.79 percent or 4.25 mln subscribers, while rural mobile subscriber base increased by 0.36 percent or 1.34 mln. – Urban Teledensity increased to 141.84 from 140.96 in July 14, while the rural tele-density increased to 44.02 from previous 43.90. – Urban mobile subscriber share stands at 58.93% as compared 41.07% of rural subscribers. – 2.83 million new Mobile portability requests were made in month of August 2014, taking the total tally of MNP requests since launch to 129.56 mln. – Active Mobile Subscriber base increased from 797.06 mln in July 14 to 807.29 mln in August 14, taking the active percentage to 87.34 percent. Idea Cellular added largest share of subscribers in August with over 1.7 million new ones coming under their network. On the other hand, BSNL lost half a million subscribers – This is the fourth row in a month when BSNL has lost subscribers. Airtel remained the market leader with 22.78 percent market share followed by Vodafone at 18.66% and Idea at 15.34%. The top 3 Telco’s now account for close to 57% of all subscribers in India. After 2 years of continuous negative growth, Tata Docomo is showing signs of improvement and have added new subscribers for second month in a row. 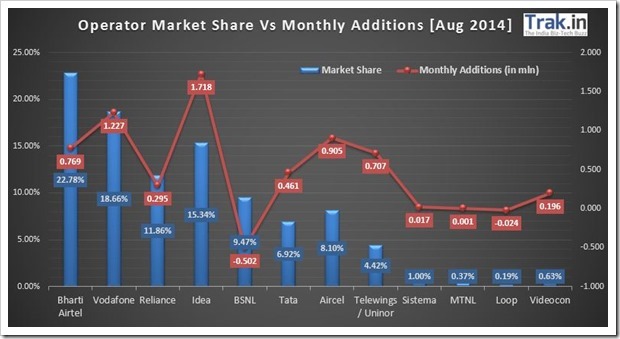 Among smaller operators, Uninor and Aircel have both managed to add 707k and 905k subscribers in month of August. Here is how Indian mobile operators have fared since start of 2014.